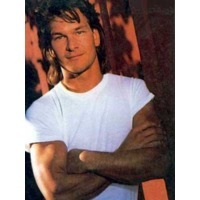 Patrick Wayne Swayze (pronounced /ˈsweɪziː/; August 18, 1952 – September 14, 2009) was an American actor, dancer and singer-songwriter. He was best-known for his tough-guy roles, as romantic leading men in the hit films Dirty Dancing and Ghost and as Orry Main in the North and South television miniseries. He was named by People magazine as its "Sexiest Man Alive" in 1991. His film and TV career spanned 30 years. Diagnosed with Stage IV pancreatic cancer in January 2008, Swayze told Barbara Walters a year later that he was "kicking it". However, he died from the disease on September 14, 2009. His last role was the lead in an ill-fated A&E TV series, The Beast, which premiered on January 15, 2009. Due to a prolonged decline in health, Swayze was unable to promote the series. On June 15, 2009, Entertainment Tonight announced the show's cancellation.